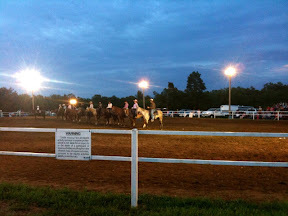 We went to the Dixon Saddle Club Horse show. They added one mule class. The mules also showed in the open classes. Tom Livengood of Dixon won the walk/ trot pleasure class with about 15 horses. Cori and Hoosier got third. Tom and his mule won the mule class with Cori in second and Loren and Lucky in third.